Loren Elliott/Getty ImagesDemocratic Senate candidate Beto O’Rourke departs after greeting supporters near a polling place last Monday in Houston. Early voting in November’s midterm elections has begun – and turnout and enthusiasm are unusually strong among both Republican and Democratic voters across the country. Republicans are outnumbering Democrats among early voters in Arizona, Florida, Georgia, Indiana, Montana, Tennessee, and Texas, in part because older voters – who skew conservative – vote early in higher rates. Election experts say that if voting rates remain at these levels, next week’s midterms could see presidential election year turnout, which would be virtually unprecedented. 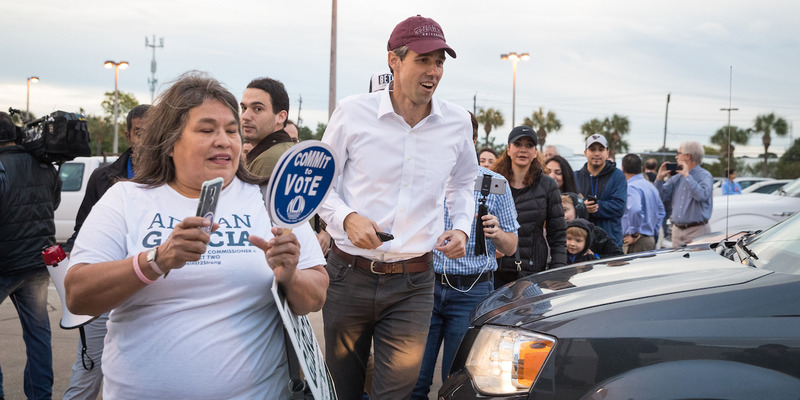 Early voting in November’s midterm elections is underway – and turnout and enthusiasm are unusually strong among both Republicans and Democrats across the country, including in key battleground states like Texas and Florida. As of Wednesday morning, nearly 24 million people had already cast their midterm ballots in 37 states and Washington, DC, according to Michael McDonald, an elections expert at the University of Florida – and early voting rates typically accelerate as Election Day nears. Election experts say that if voting rates remain at these levels, next month’s midterms could see presidential election year turnout, which would be virtually unprecedented. In Indiana, where Democratic Sen. Joe Donnelly is hoping to hang on to his seat in a competitive race, early voting turnout is at presidential election year levels. And in Georgia, where voters will decide a hotly contested governor’s race, voters are casting early ballots at three times the rate of the 2014 election. Florida-based Democratic strategist Steve Schale noted on Wednesday that more voters have cast ballots so far in his state than voted early in Florida’s 2014 midterms. Texas is seeing similar numbers. As of Tuesday, early voter turnout has already exceeded total turnout in the 2014 midterms (including that on Election Day) in the 30 counties where nearly 80% of the state’s registered voters live, The Texas Tribune reported. Last week, the Houston Chronicle likened the nearly 2,000 people – many of whom camped out – outside an early voting location in Houston on the first day of early voting to a Black Friday shopping crowd. This may be in part because older voters – who skew Republican – usually vote at higher rates by absentee ballot, while Democrats show up in bigger numbers in person before Election Day. Mail-in voting is particularly popular among older voters. And in some states, like Michigan, where every voter over the age of 60 is guaranteed an absentee ballot, it’s encouraged. While the early votes cast so far clearly signal elevated turnout and energy, the numbers don’t necessarily reflect the final outcome of any election. And while Democrats maintain their lead on the generic congressional ballot, President Donald Trump’s approval rating reached an all-time high of 47% in that poll.